We should not accept the narrative that there is a bigger problem of antisemitism in the Labour party than anywhere else. The right-wing Zionists, the Board of Deputies and the Jewish Leadership Council, most of whom are in the Tory party, began making these false allegations immediately Corbyn was elected, aided by the Blairite wing of the party and the entire mass media and Tory party itself. These are outright lies and we should not give them credence, no matter how often the lies are told or how loudly they are shouted. Britain is one of the least antisemitic countries in the world. I cannot find a single instance of a Jewish person being murdered for their race or beliefs by the public or in police custody since WWII. In that time hundreds of Blacks, Muslims and Irish have been. There have been some serious assaults but very few in that period. The Labour party itself has less anti-Semitism than any other main-stream party in Britain. Of the 2,025 British Jewish people who responded to the survey, 83 per cent said that Labour is too tolerant of antisemitism among their MPs, members and supporters. 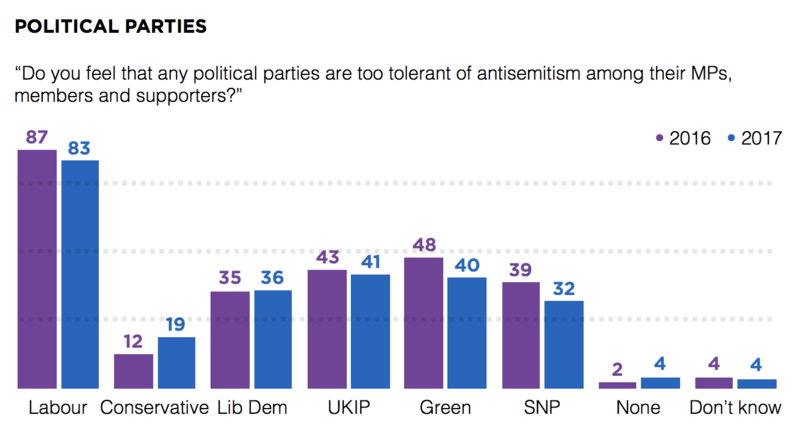 That’s significantly higher than the proportion of British Jews who think the Conservatives and Liberal Democrats are too tolerant of antisemitism (19 per cent and 36 per cent respectively). So the 83% majority who think that Labour is worse than the rest is composed of 63% Tory voters and 20% who are told nothing else day and night now for almost 3 years. Note that 83% also think the Liberal Democrats are almost twice as bad as the Tories on anti-Semitism. The truth is, apart from racial and religious origins, very wealthy people generally vote Tory, poorer middle class and workers vote Labour. There is obviously some factor of allegiance to Israel which does sway some votes but that, I would suggest, is a marginal factor. So the fear being exploited by reference to the Holocaust is fear of the almost 600,000 new voters and fear that a radical Labour government would tax the rich too much and a darker fear of revolution of the oppressed masses rise up against the whole system. A view common to all capitalists everywhere and accepted as given by the vast majority because they accept that capitalism is the only possible way to run society. It found that 90 percent of British Jews support Israel’s right to exist as a Jewish state, 84 percent feel a “deep sense of pride” in its achievements in art, science and technology and 93 percent say Israel plays a part in their Jewish identity (73 percent say an “important” or “central” part). This shows a very wide range of opinions, ranging from the majority Tory voters, more liberal LibDem and Labour voters and obviously a small minority of left-wing antizionist Jews. 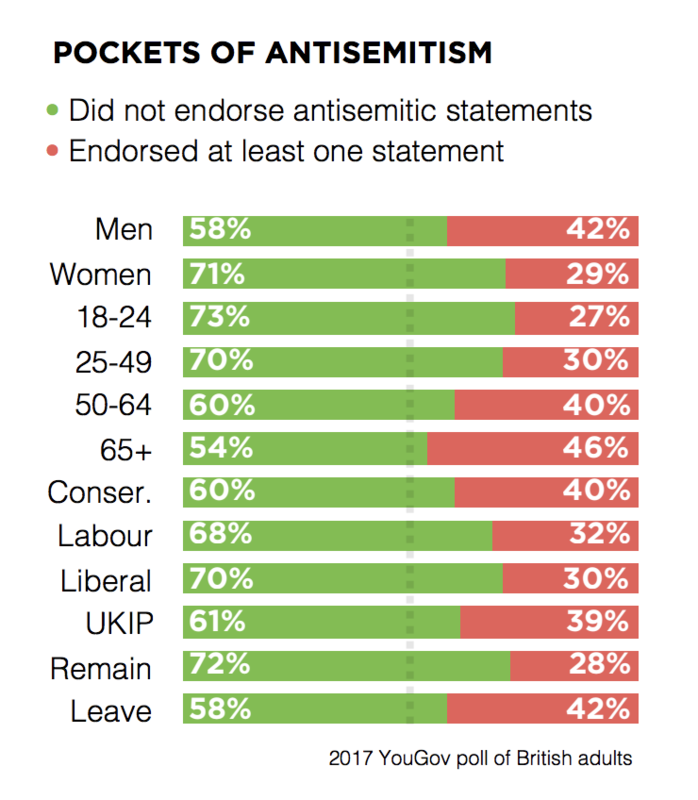 Corbyn is reasoning that at least he might save the 26% who voted Labour in 2018, 13%, a half of whom think Labour is far too anti-Semitic. But this constant capitulating to this pressure only strengthens and emboldens the attackers and this very obvious weakness in the face of an obvious enemy force contains the big danger that it will alienate his own core supporters, who will conclude that if he cannot fight this he won’t be able to fight the whole capitalist class id he makes any inroads whatsoever into their private property and privileges. Georgina Lee, Channel 4 News, 25 Apr 2018, https://www.channel4.com/news/factcheck/factcheck-antisemitism-political-parties.